The event went off without incident and all participants and volunteers remained in spite of rain. Three local governments supported our event this year by co-hosting the discussion segment. Our volunteers provided an EV shuttle service to the discussion and free lunch served at the discussion about EV charging in Multi Unit Residential Buildings. Approximately 50 interested citizens and 8 technical experts participated in break-out discussion groups to explore; legal barriers to EVSE in MURBs , working with condo councils, the technical and social barriers to deployment of EV charging in common areas of condos and apartment buildings, and EVs 101- living with and EV. 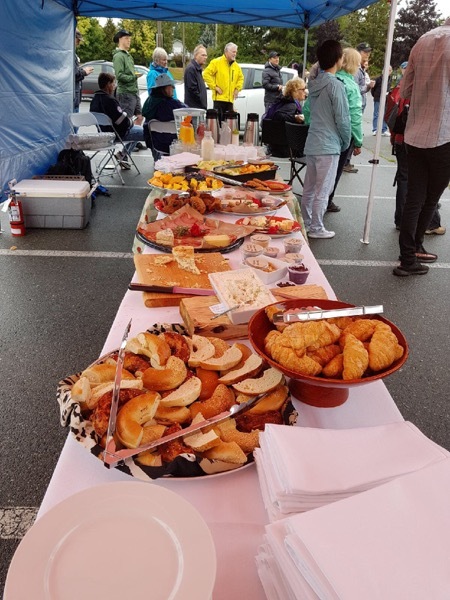 Our crew were well cared for with a "zero waste" all day breakfast buffet service and crew remained on site until the last tent and chair was packed away. It was difficult to motivate some Scenic Ride EV owners (ironically local EV club members) to maintain a ride-ready stance rather than turning the event into a typical park-and-chat. By opening their hoods and doors they miscommunicated to some EV-ride guests that the rides had ended and the cars were not available. The barriers to EV adoption are mostly social and some are caused by us, EV owners. Volunteers were asked to let the cars do the talking and let our guests' inner voice "drive change!" Unfortunately, some EV owners are so proud to be part of this movement they are unable to suppress their exuberance. This demonstrably hindered the EV ride experience of some of our guests. We communicated the event themes clearly at the beginning of the event but it's even difficult to get volunteers to adhere to a philosophy they have agreed to when the EV spirit carries them away. We had many compliments about the test drive segment of the event despite the traffic jam in Scenic Rides. We still can't control the weather, but we had fun inviting dozens of local motorists to Drive Change! Maybe our next event should be only Test Drives? This event is strictly non-commercial! (no sales activities, pitches or transactions on-site please). It’s open to the public at no cost to our guests. We invite EV-curious motorists to experience our electric vehicles and let them discover for themselves how driving an EV would enhance their life. Time and EV availability permitting, people who stop by the event may also be able to ride in or drive an EV. 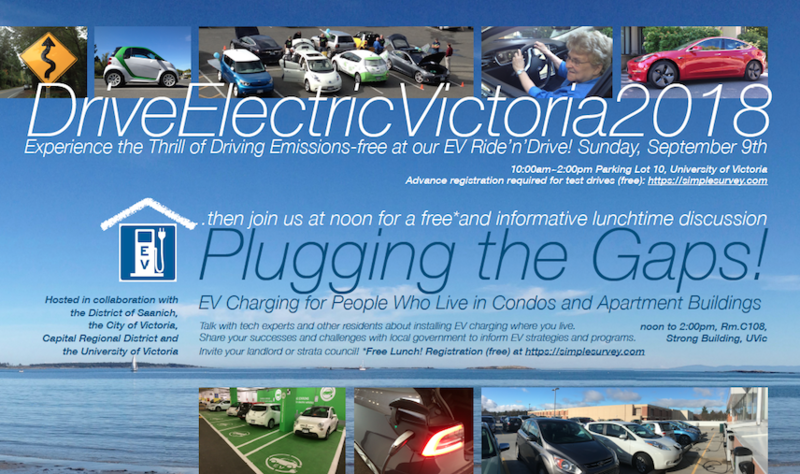 We hope to see you at DriveElectricVictoria2018 “EV Ride’n’Drive” and hear from you at "Plugging the Gaps!" Registered attendees report 148,050 electric miles driven.